Just what point has Our Harry Kane reached in his astonishing adventure? Is this the peak? Is there more to come? Does it really get better than this? I have not seen anything like it since the days when Greavsie was slicing open defences � the opposition fans applauding the player who was taking their team to the cleaners. The Huddersfield supporters were warmly appreciative and wonderfully sporting in their response to their �Kaneing� as Harry left the John Smith pitch on Saturday after gracing it with two more from his growing gallery of goals. You need be very special to have the rival fans politely praising your performance. And Harry is special to the point where he has all Spurs fans nervously looking over their shoulders for bidding clubs. If he continues like this, you can bet your boots Daniel Levy is going to be tempted by offers in excess of �150 million. The only way Daniel will be able to keep him is with a wage the equal of what the best paid players in the Premier League are getting. This means he has to at least treble Harry�s wages. You might not want to "bet your boots", but if you like a casino then try http://top10freespins.com/. They have some great deals for October. We have seen the likes of Berbatov, Modric and, of course, Gareth Bale snatched from us, but with respect to each of them Harry is in a class of his own because he is a goal machine. That is the rarest and most cherished animal in football. Our lucky guru Paul H. Smith has witnessed every one of his goals (Ed:Let's say most!) from a st"and seat, and reports on his latest double strike HERE. I have to make do with a sofa view, and feel absolutely privileged to watch him scoring goals we mere mortals can only dream about. And what I particularly love about Harry is that even when he is in a dry spell he works his football socks off for the team. He has bundles of confidence but little arrogance, and is a great advertisement for his often maligned generation. I don�t think we will ever see footage of him throwing punches outside a nightclub. I believe former Spurs pin-up idol David Ginola will have to make a reassessment of his judgement that Harry is not in Alan Shearer�s class. He has a long way to go to catch Shearer�s Premier League record of 260 goals, but I would not bet against him if he stays in the domestic game. Because of my long (loving) association with Jimmy Greaves, I am continually being asked to compare Harry with him and which is the better goal scorer. As I have written 20 books in harness with Jim I am obviously biased towards the little genius, but Kane has an army of modern Spurs supporters rooting for him. Let�s remember that you have to be 50-plus to have seen Greavsie playing in a Lilywhite shirt. There is no way you can measure them except by goals output. Jimmy was 5ft 8in, 10st 8lbs at his peak, and he had a low centre of gravity. He used to beat defenders with cunning running and electric dribbling. His goals were nearly always stroked into the net as if he was passing the ball, and he had a lot of tap-ins in his collection, because of his uncanny ability to be in the right place at the right time. Two footed, preferring his left. Harry, born just five miles from Jimmy�s East Ham birthplace, stands 6ft 2in, and weighs 13st. 7lbs. He is much more physical than Jimmy, a throwback to centre-forwards who played with muscle as well as method, He can shoot powerfully and accurately with either foot (preferring the right), and is potent in the air. He is the complete package. Runs himself into the ground, while Jimmy famously took breathers. You cannot put Harry in the Greavsie bracket until he matches Jimmy�s phenomenal goals output. He scored a record 357 First Division goals (200 of them before he was 23), 266 of them for Tottenham, and another 44 goals for England in just 57 games. When Harry has those sort of figures to support him, then you can start debating which was the better goal scorer. Let�s just say Harry is on his way. In style, and with guile and a smile � and even the opposition fans love him. Real Madrid will be monitoring him close up at the Bernabeu on October 17! 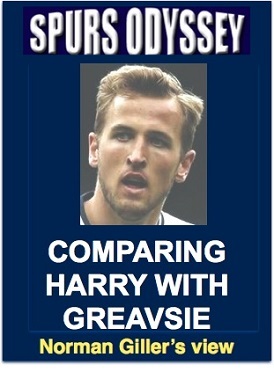 Mr Levy had better prepare to get his cheque book out and hand Harry a big fat rise. I know I speak for all Spurs fans when I say that selling him must not become an option. WEEK 8 of the Sports Odyssey Quiz League 2017-18. The rules are simple: I ask one Tottenham-related question for which a right answer earns you two points, and then a related teaser that can bring you an extra point. Who won 17 international caps, joined Spurs from Newcastle and left them for Aston Villa? Which manager signed him for Tottenham in 1997? Please email your answers by Friday�s midnight deadline to: soql8@normangillerbooks.com. Keep a check on your points score, because I can never rely on my server that often loses emails in the ether. Answer to last week�s question was Terry Medwin, the big-hearted Welshman who wore the number 7 shirt when helping Tottenham retain the FA Cup against Burnley in 1962. Terry celebrated his 85th birthday last week and is a true Spurs legend. First name drawn from the correct answers was Alan Thomson, from Guildford. He has been a Spurs supporter since the late 1960s. I will send Alan a screen version of my Spurs �67 book (you might consider buying a signed hardback copy from me at http://www.normangillerbooks.com � all profits to the Tottenham Tribute Trust to help our old heroes).